I love the office- The staff is amazing & Dr. Jones is fantastic. Dr. seems to know what he is doing- "Good game plan!" Very nice & proffessional. Very satified! Staff is amazing as well as the doctor. Dr. Jones was very informative and honest with me about the procedure. Excellent experience. Surgery was successful and my pain is gone. 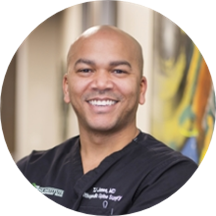 Dr. Thomas Jones, MD has no appointments on Zocdoc right now.